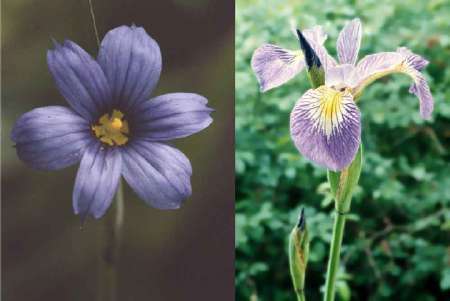 Blue-eyed grass, greatly enlarged, left, and large blue flag iris, right. A wild iris blooms in Westborough's swampy places in early June, when cultivated irises grace our gardens, and a tiny relative called blue-eyed grass appears in our fields. With large, showy blossoms similar to garden iris, large blue flag (Iris versicolor) is a delightful surprise when you come upon a clump in a swampy area of. the woods or along a shoreline. So many woodland wildflowers are small and unobtrusive, but this wild native iris is an exception. The blossoms of blue-eyed grass are tiny enough to miss among the grass-like leaves, somewhere at knee-level, if you don't glance down as you walk through a sunny, dry field. You might also see blue-eyed grass at the edge of an unpaved parking lot. Try the Bowman Street Conservation Area parking lot off Bowman Street . With its many swamps and damp places, Westborough is well suited for large blue flag. This iris grows where its feet can stay wet year-round, in swamps, wet fields, and swampy margins of ponds and streams. Both Sandra Pond and Mill Pond have blue flag in places. Blue flag iris can form large colonies, but in Westborough these days you are more likely to find it in small clumps. The summer droughts of recent years have been hard on blue flag, often drying out the places where it lives. Blue flag is also known as poison flag and is considered poisonous. Its thick rootstock contains substances that are irritating or toxic. Nevertheless, large blue flag has a long history of medicinal use among native Americans and colonists. They used the root to treat problems of the digestive tract and to make warm wet dressings for healing bruises or wounds. Today it is sometimes included in herbal remedies for obesity or loss of appetite. Along similar lines, blue-eyed grass has historically been used as a laxative as well as a treatment for diarrhea. In spite of its name, blue-eyed grass is not a grass. Rather, it is in the iris family, along with large blue flag. These two plants differ greatly in size and where they grow, but they share some similarities. Both have flowers patterned in multiples of three, grass-like or sword-like leaves, and rootstocks that provide enough energy for the plants to flower in June not long after their leaves come up. Seen in at least one place in Westborough is yellow flag iris (Iris pseudacorus), large and lovely but regarded as an invasive alien species. This yellow iris was brought to American gardens from Europe and escaped into the wild. There it readily forms dense colonies along shorelines and outcompetes native wetland plants. It is also somewhat drought-resistant. Yellow flag also grows in nearby waterways in Marlborough.